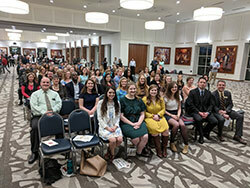 The Liberty University Chapter of Tau Sigma National Honor Society recognizes transfer students who have a 3.5 GPA or higher after their first semester at Liberty University. Transfer students comprise 18% of Liberty University's new students each Fall and 20% of Liberty University's new students each spring. In Spring 2018, Liberty University inducted 562 members, including Liberty University Online. The honor society is overseen by the leadership of Dr. Brian Yates, Dean of CASAS. You must have transferred to Liberty University from another academic institution with at least 24 college credits at the prior institution(s). You must be registered in a course of study leading to a bachelor's degree for an amount of work equal to an average full load (usually 12-15 hours - however, the definition of a full load is left to the discretion of each institution). Your minimum academic average required for membership is either a 3.5 on a 4.0 scale at the end of your first semester here at Liberty University. This year Tau Sigma National Honor Society awarded 57 scholarships totaling $100,000. Information regarding the 2019 scholarships will be available this fall. Today, over 100 other universities have established or are currently establishing Tau Sigma chapters in their efforts to improve the services that they provide to their transfer student population.